This Floating Dock Inside Corner Kit includes 4 heavy-duty inside corners and 4 backer plates. Use this kit for all floating dock applications. 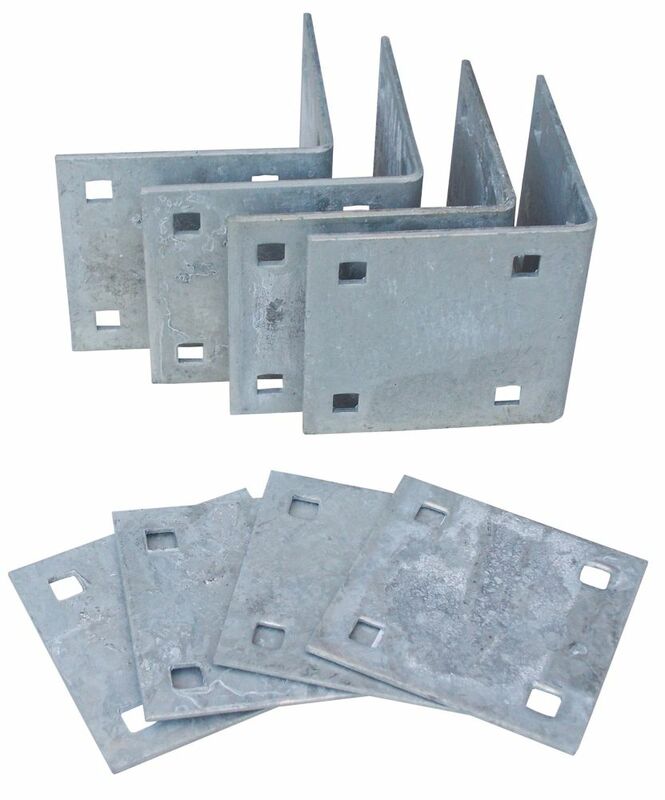 The included hardware is 1/4-inch nominal hot dip galvanized steel, with 9/16-inch holes for 1/2-inch carriage bolts. This kit includes all hardware, bolts not included. Includes 4 heavy-duty backer plates, 5" x 5" x 1/4"
Our brand new Universal DK2 Avalanche Snow plow kits combine the simplicity of our original T-Frame plow with the strength of our custom mount fram. The DK2 Avalanche snow plows allows you to quickly and effectively remove snow from your driveway or small parking lot. The Avalanche simploy slides into a 2 inch. front mount receiver for easy removal and storage. Each plow ships in a single carton complete with hardened steel cutting edge scraper, rubber snow deflector, polymer-wrapped wire rope plow markers, skid shoes, castor kit for easy storage, and a 3,000lb wireless electric winch. Each Avalanche plow will also include a set of adjustable blade stifeners for added strength by creating a 3 point connection. Fits ANY vehicle that has a 2 inch. Class III front mount receiver (not included) 1 Year Warranty. The DK2 Summit II Snow Plow allows you to quickly and effectively remove snow from your driveway or small parking lot. DK2's range of personal plows each mount on to a vehicle specific custom mounting brackets. Each snow plow ships in a single carton complete with hardened steel cutting edge scraper, rubber snow deflector, polymer-wrapped wire rope plow markers, skid shoes, castor kit for easy storage, and a 3,000lb wireless electric winch. This Deluxe Dock Wheel Kit makes putting your dock in the water and taking it out a much easier task. These heavy duty wheels are 24-inch in diameter and 8-inch wide. They are made from polyethylene and are U.V. stabilized. The wheels are designed to fill with water as you roll them in, giving the dock weighted stability at the bottom of each leg. Because of innovative designers, track lighting has come so far in the decorating world. Gone are the days where you it to be hidden - let's bring on the light! Versatility is the name of the game and Globe Electric is doing it right. Globe Electric's Grayson 6-Light Adjustable S-Shape Track Lighting has a brushed steel finish and a unique s-shape that brings a new look to a classic design. Each of the six track heads are independently adjustable so you can direct and focus your light where you need it the most. Ideal for use in kitchens, bedrooms, living rooms, hallways, dining rooms, this fixture allows you to point light exactly where needed without multiple light fixtures. Make your home feel liks a swanky loft or an art gallery in one easy step. Includes all mounting hardware for quick and easy installation and six 50W equivalent MR16 halogen light bulbs. Floating Dock Inside Corner Kit with Galvanized Steel Hardware This Floating Dock Inside Corner Kit includes 4 heavy-duty inside corners and 4 backer plates. Use this kit for all floating dock applications. The included hardware is 1/4-inch nominal hot dip galvanized steel, with 9/16-inch holes for 1/2-inch carriage bolts. This kit includes all hardware, bolts not included. Floating Dock Inside Corner Kit with Galvanized Steel Hardware is rated 5.0 out of 5 by 1. Rated 5 out of 5 by tomthebomb from The Dock Edge 'Floating Dock Inside Corner Kit' along with the Dock Edge 'Floating Dock Inside Jo... The Dock Edge 'Floating Dock Inside Corner Kit' along with the Dock Edge 'Floating Dock Inside Joist Corner Kit' really stiffened up my 8' X 8' dock. Nice heavy braces! Highly recommend.